Tomorrow is ASPCA's "ID Your Pet Day"...And Gift Pack GiveAway! 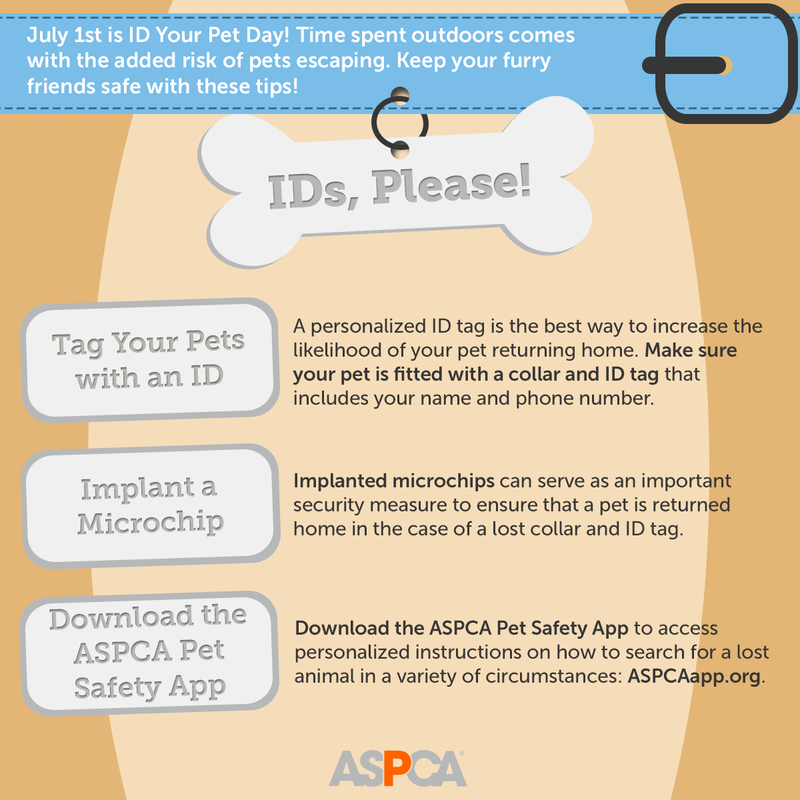 We're excited to spread the important news: The ASPCA has created "ID Your Pet Day" — and that's tomorrow, July 1, 2016! This campaign intends to raise awareness among pet owners that it is incredibly important (and potentially lifesaving!) to have an official ID tag for your pet. 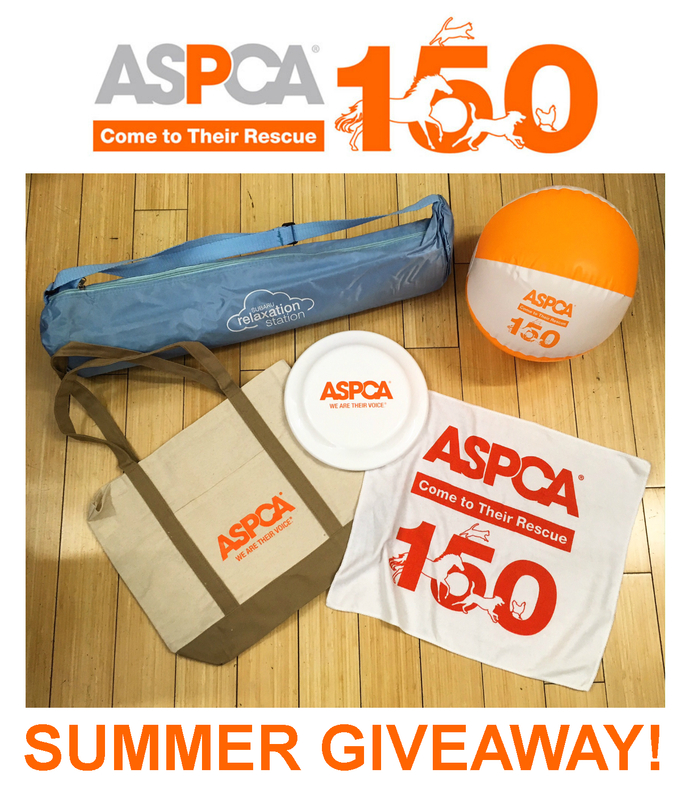 Courtesy of our friends at the ASPCA, we also have an ASPCA Summer Gift Pack to giveaway to one lucky reader! See details at the end of this post about the gift pack and how to enter. With the July 4th holiday just days away, and its attendant fireworks, backyard barbecues and other outdoor festivities, it's especially important for pet owners to keep careful watch of their beloved pets. 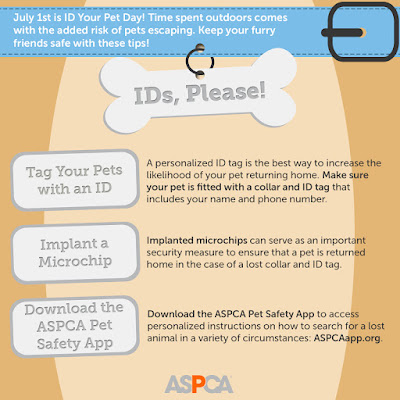 But just in case your dog or cat manages to slip through, over or under a fence, or otherwise escapes the security of their home and yard, a personalized ID tag is the best way to increase the likelihood of your pet returning home. So make sure your pet is fitted with a collar and ID Tag, and is microchipped, just in case the collar and ID is somehow lost. Don't forget to download the ASPCA app to your smart phone to access personalized instructions on how to search for a lost animal in a variety of circumstances. What a wonderful tool to have in an emergency! And check out this nifty ASPCA infographic to help you ensure your beloved pet will be safe and sound. Just follow the simple Rafflecopter directions to enter...and good luck to all! We have our collars with our ID on 24/7. You can never be too careful! Great info, Bocci! We have all of ours micro-chipped also. I would love to win and start doing some yoga! I love the ASPCA. They do such great work! My pets are also micro-chipped. It's good to be prepared. Husani and I want to WIN!! I would love to win this for our newest rescue!!! Our dogs have collars with their names, address and telephone. We want to win. I love the ASPCA!! I would love to win this wonderful giveaway!! This would be great to win. Thanks for the opportunity! (Emily Ann on rafflecopter) I would love to win this. Some great prizes in the pack! I'd sure like to win for my Blackie. The ASPCA is such a great organization. I invested in an ID tag that the collar slides into. The conventional kind kept being lost during our walks. This would be great! Thanks for the chance to win it! I would like to win. I adopted my dog from a shelter! I'd like to win. Thank you. I'd like to win this for my dogs. Thank you. I would love to win. We love dogs, the ASPCA and animal rescue organizations! I'd love to win. All 4 of my current pets are rescue pets. 1 doggie and three kitties. Our dogs love playing frisbee and I love yoga. Perfect for us! Would love to win this, you are a wonderful group. I want to win! Thanks for the chance. I would like to win. Thank you to the ASPCA for all their compassion and energy to do the right. I would like to win the ASPCA Summer Gift Pack because the organization does great things for all animals and my dog could really use the items in the prize pack especially the Frisbee. I would definitely love to win! Thank you for the giveaway!